Roast a chicken just the way you like it. Don't overdo it. Cube some stale bread, soak it in olive oil, season it with salt, pepper and slivers of fresh garlic. Toast bread cubes in the oven until golden. In a large bowl make up a dressing - a glug each of red and champagne vinegars, an equal amount of oil, salt, pepper, whisk to emulsify. Add the croutons and mix well, Pour on any chicken juices left in the roasting pan too. Leave for a few minutes until the bread starts to soften slightly. Untangle some watercress, finely slice some spring onions, shred a few leaves of lovage and introduce the greens to the mix with your hands. Gently mingle the elements together until they are all glistening. Surround with the bread salad. Wait, but not too long, until your dining companion remarks that this is the best and most juicy chicken he has ever tasted. Revel in the marvel of having made something so delicious completely on your tod. Looks delicious - very similar to the famous delicious chicken and bread salad in the Zuni Cafe cookbook - one of my favourite ways of eating chicken ever. Looks very tasty Sam and beautifully presented. Sam, it sounds like such a lovely meal. It's fun to see how you are making use of that wonderful farmers market produce. Well of course, you present such a fine bird as that on a dish whole. Roasted chicken is how I fooled a former boyfriend into thinking I am a great cook. Damn girl that sounds so good right now...so hungy here! Lovage...that brings back some memories...and there's much dignity in being beautifully roasted, served with lovely fresh green things. Yum. Lovely dish, Sam. I love a well-prepared roasted chicken. Re: FBFM, I was pleased to meet you also! Hi Sam, 1st time visit to your site, the bird looks good and you're the 1st person I've seen who's used lovage....is it really "celery-like" or mild? I'm on a bit of a no carbs diet at the mo. This looks positively delightful. A must try. I'm not sure I know what lovage is though. Your dish is spectacular. Congratulations on, uh, *winging* it! Very Zuni-ish. I actually made something similar a while back and added some lemon and cut up avocado. THAT was good. Lovage certainly smells celery like and it has a little taste of it too, and slightly curry-ish but with an after taste of something I can't quite describe. You only need a teeny little bit in your dish or else it will over power. But eating them one at a ltime on their own is a fun experiemnt. I made lettuce and loveage soup last night and it was delicious but only 5 leaves of lovage went into the pot and that was just the right amount. I am glad I didn't put in more. The salad looks fabulous and I'm loving the lovage info. I tend to use my fresh herbs with a fairly heavy hanc, so am glad to know I need to exercise a little restraint with the lovage. Boy that sounds so good! 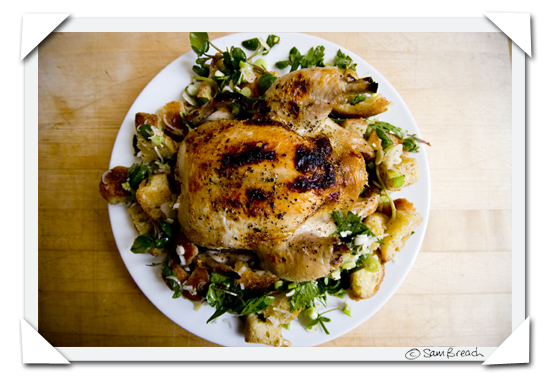 Love a good roast chicken and love the roast chicken and warm bread salad at Zuni Cafe so this would be great to try at home. Thanks!